Wireframe. In this post you will learn about our plans for the Epilepsiome database that is envisioned by the ILAE Genetics Commission. This knowledge database will curate information on epilepsy and genes. Also, it should be up-to-date and written in a straightforward “this is what you must know” style. Basically, the website that you want to go to if you need an update on a given gene or syndrome. But how do you get started on a project like this? Let me start by telling you what a wireframe is. The idea. Epilepsy genetics it becoming both more complicated and also more relevant. With the advent of big data genomics, we witness an explosion of gene findings, uncertain variants and constant questions whether a gene finding that was made five years ago is still relevant today. We would like to curate the information on epilepsy and genes and present them in an easily digestible manner that will help you in daily practice. Don’t get me wrong. We don’t want to create a second Orphanet, OMIM, Wikipedia or GeneReviews. We feel that we need a resource that condenses all the information for our daily use. The inspirations. There are two major ideas behind the Epilepsiome concept. First, we would like to adopt a strategy that was successfully used by the autism genetics community. Supported by the Simons Foundation (SFARI), all genes related to autism underwent a review and scoring process. The results of the scoring can be found in the SFARI gene 2.0 database. This database provides a good overview on how these genes should be regarded with respect to autism. The other major idea was to create a knowledge base modelled after the neuromuscular homepage. We felt that this database should provide an ideal companion on our way through the genomic revolution into the era of personalized medicine. The wireframe. So what is the wireframe that I mentioned earlier? A wireframe is a mock-up website that helps you develop ideas. Some wireframes (or so I learned) are so complex that they almost parallel entire website. Others, in contrast, are very easy. 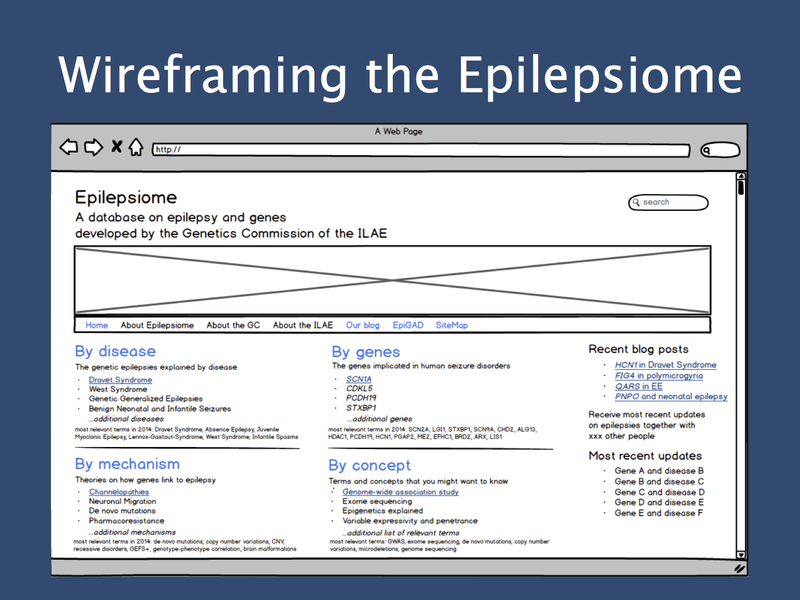 We used Balsamiq to come up with some ideas on how the Epilepsiome should look like. The result can be seen in the attached interactive PDF (link). Over the next 12 months, we will have two tasks ahead of us. 1 – The content. We will assemble a group of YESTI’s – “young experts with sufficient time and interest” to join the Epilepsiome data review team. Every gene will be reviewed by two experts and scored. Our initial idea was to meet in early 2014 for a final consensus meeting. A quick spoiler: we already assume that some genes that are still mentioned in the literature won’t receive a passing score. The report on these genes will be straightforward, easy to digest and visually appealing with diagrams, infographics and overviews that can be used and reproduced under a Creative Commons license with attribution. 2 – The database. We plan to use a Joomla platform for the Epilepsiome database for the first year. Joomla is one of the most popular Content Management Systems (CMS), it’s free and comes with a lot of extensions. We are thinking about switching to a customized system during the process. Down the road, we are also thinking about an iPhone/Android app that allows you to carry the Epilepsiome with you during your clinics. The Epilepsiome needs you. Getting the Epilepsiome off the ground will be a major task – at this stage we’re happy for everybody’s help and input. If you have an interest in contributing, please let us know. This entry was posted in 2014, ILAE Genetics Commission and tagged Balsamiq, epilepsiome, GeneReviews, genomic revolution, human gene mutation database, ILAE Genetics Commission, OMIM, Orphanet, personalized medicine, Wireframe. Bookmark the permalink.